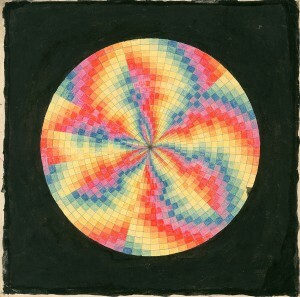 In his Journal, Ivan Wyschnegradsky wrote that he had been fascinated by the appearance of rainbows since childhood. Moreover, he gave this title (Arc-en-ciel) to his Opus 37 (1956) for six pianos, tuned a twelfth-tone apart. 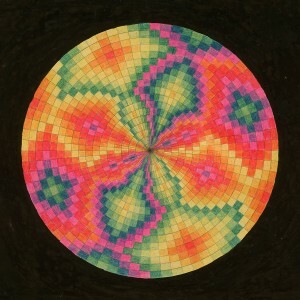 In 1940, his research led him to use colours to note the micro-intervals. 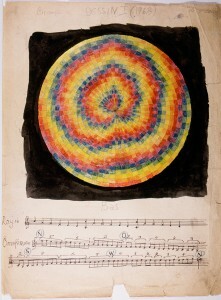 Simultaneously he drew up plans for an ultrachromatic piano with several superposed coloured keyboards. 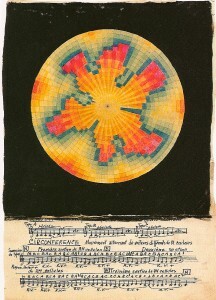 With the passion that typified him, he studied the analogy of sounds and colours, i.e., the correlation between the 12 notes of the chromatic scale and the 12 colours of the spectrum (six fundamental colours — red, orange, yellow, green, blue, violet — and the six ‘intermediate colours’, like blue-green, violet-blue, red-violet, etc. ). 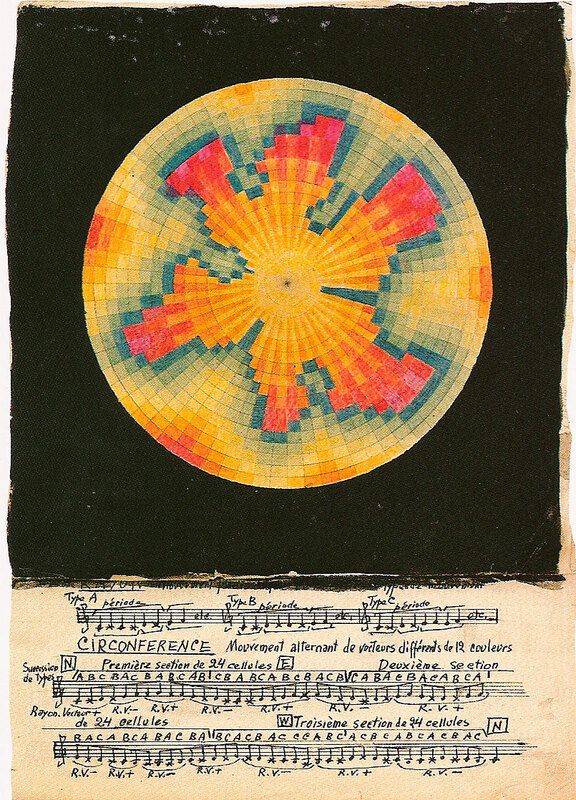 He also thought of Scriabin’s luminous dome with changing colours under which a great symphony of total art would be played. 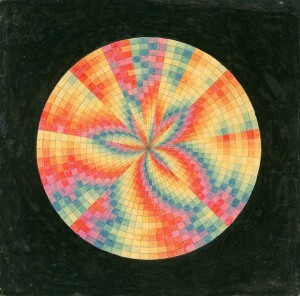 In late 1943 he wrote in his Journal: ‘… I’ve elaborated the visual side of my work. I am forming the luminous mosaic project and studying the sequence of colours and forms that result a given sequence — on the circumference and meridian’ (1). 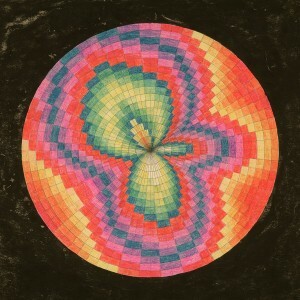 He meticulously envisaged, with a mathematician’s precision, the modalities for realizing this luminous mosaic, drawing subdivisions in concentric circles and in sectors defining the moving, coloured cells of light. After the trying years of war and reclusion in the sanatorium, he again devoted himself to composition and musical theory. In 1968, however, he resumed the drawing of these Études chromatiques. Are they linked to his meditation on the sound continuum? The circle, the perfect form, is visualized by its circumference, a continuous line that has neither beginning nor end. 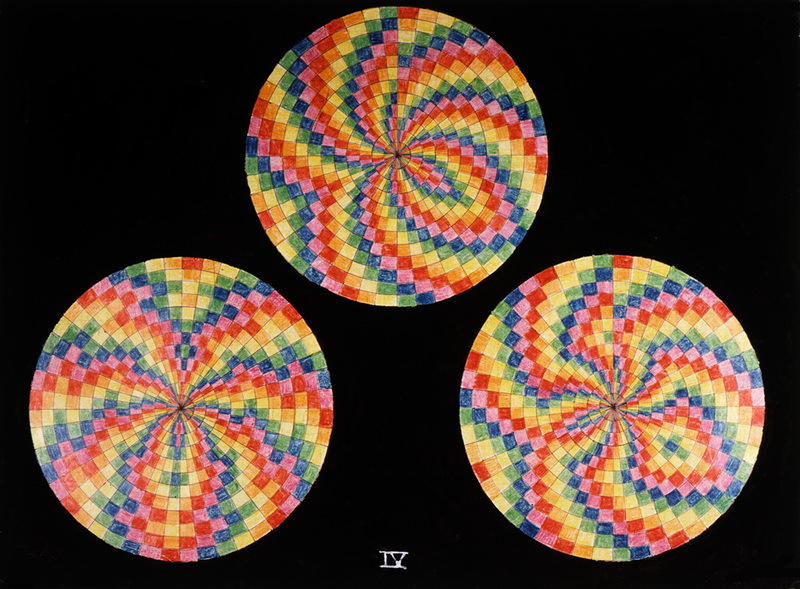 Do the chromatic circles give a first visual approach to Pansonority, which includes ‘an infinity of sounds arranged at an infinitely small distance’ (2) [and which] has no limits either in the lower or upper register’? Ivan Wyschnegradsky specified the reduction of his graphic research in relation to the ideal luminous mosaics. They are represented by a flat circle; the coloured lights drawn in pastel and colour pencil; their motion is described by the musical sequences that underlie each construction. But as is, these Études chromatiques gave rise to numerous developments of great subtlety, and their construction evolved over the years. They ended up taking on their ‘own value’, to use the composer’s expression (3). He drew with a ruler and compass the basic graphic frame, a circle 18 centimetres in diameter, and its subdivision on a 24 x 24 cm sheet of paper. Then the colours were meticulously added with coloured pencil and pastel, the black background being added afterwards. The preserved drawings were glued to cardboard. Let us try to give a very simplified idea of their structure. A circle or hemisphere is divided into equal sectors by meridians (rays), and in equidistant concentric circles, the circumferences. Their number can vary according to each construction. 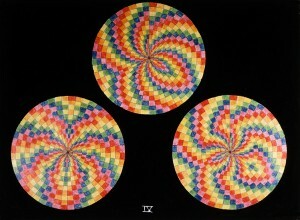 On the second Étude chromatique, reproduced here, the whole circumference is divided into 144 equal portions of arc of circle. By introducing the cardinal points, there are 36 between north (N) and east (E), 36 between E and S, etc. This subdivision according to the cardinal points is meant to facilitate the reading of the construction and also allow for local, independent variations on the overall composition; the meridians are divided into 36 equal parts. The fractioning of meridians and circumferences results in cells numbering 144 x 36 = 5,184. 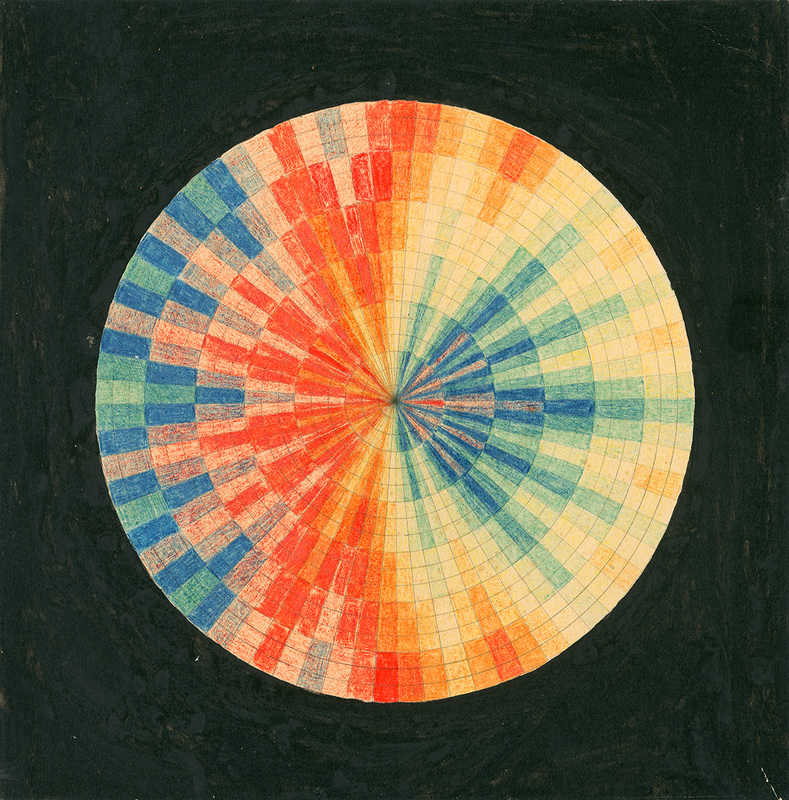 Each cell receives a colour according to its position at the intersection of a meridian and a circumference. To each of the 12 colours is assigned a note of the absolute chromatic scale, i.e., without distinction between sharps and flats (as do the black keys of the keyboard). The notation is that of Obukhov, who designates these semitones by a slanted cross (see the first Étude chromatique reproduced). The sequence of colours along a ray is noted by a musical sequence. 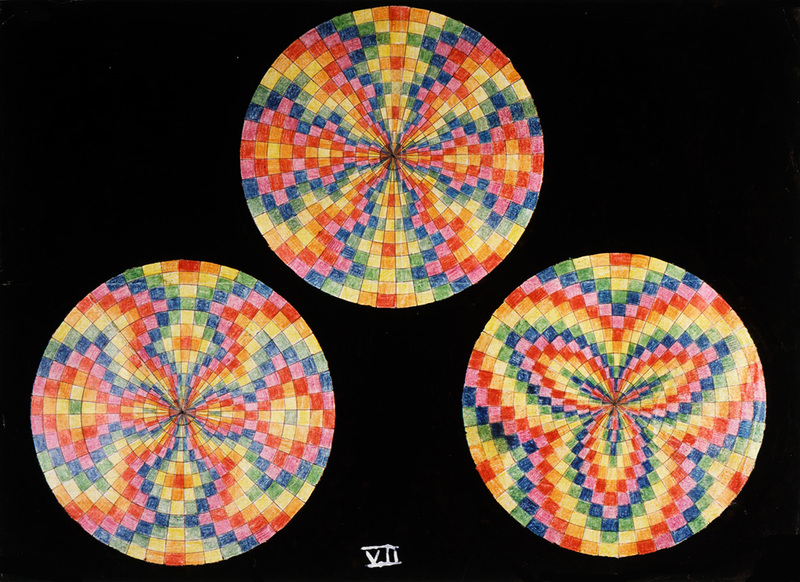 It is the same for the colours following one another along the circumferences; but their sequences differ in each of the four cardinal sectors (4). The chromatic variations are introduced during the passage from one circumference to the one that is immediately inside, following a meridian. The meridian then acts like a vector that gives, step by step, to the cells crossed, the notes — hence the colours — that follow one another on their own stave. To adorn the play, each vector can act locally in both directions, either towards the centre (+) or in the opposite direction (-). In addition, in the first Étude chromatique reproduced, there are three different vectors, A, B and C, that impose themselves on the cells in keeping with the permutations indicated along the circumferences. It is not difficult to follow a ‘melody’ by going along a meridian or a circumference, the passage from one scale to another being visualized by the leap of a violet cell to a red cell. 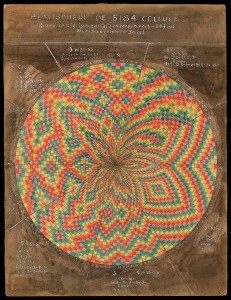 Ivan Wyschnegradsky had acquired growing mastery of these strange mosaics. He observed their diversity in keeping with musical sequences. 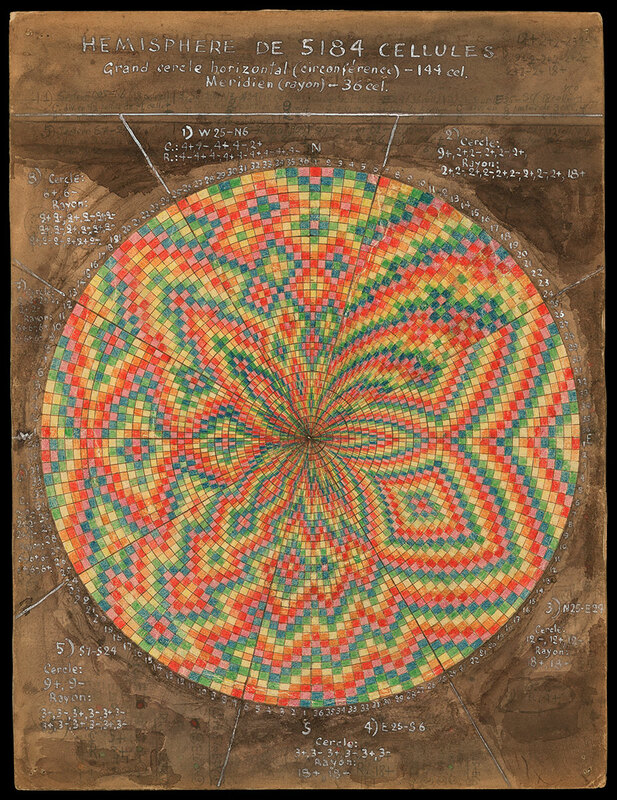 He could predict their final aspect: spiral like a galaxy or symmetrical central like the corolla of a flower. These main figures stand out against the quasi-monochrome of the solid background. 1 Quoted by Barbara Barthelmes, Raum und Klang, das musikalische und theoretische Schaffen Ivan Wyschnegradskys, Wolke Verlag, 1995, p. 207. 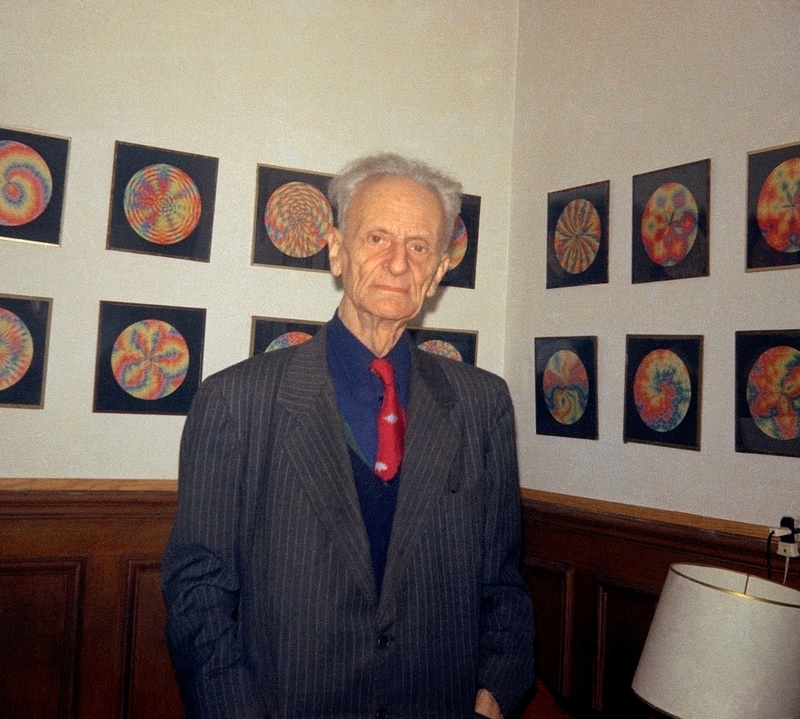 2 Ivan Wyschnegradsky, La Loi de la pansonorité, Contrechamps, 1996, p. 68. 3 La Revue Musicale, n° 290-291, 1972, p. 91. 4 This construction system was deciphered and explained by Barbara Barthelmes, op. cit, p. 203.